This is our late GSD puppy, Sadie Marie. We sadly lost her to liver failure on June 26. 2010 when she was ten months old. In this photo, she is enjoying the Michigan snow. Dear Kimberly, Thank you so much for sharing your wonderful story about your German Shepherd puppy, Sadie Marie, with us. Let me say right up front that I am so very sorry for your loss - it is a shame you didn’t get the chance to have more time together with your GSD pup, Sadie Marie. 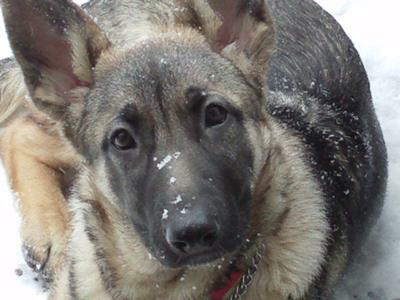 What a wonderul GSD puppy your Sadie was. And I know she will be missed. And to our readers, thanks so much for reading this story and please come back often to see what else is going on in our growing German Shepherd community. Let us know what you think about the above story by leaving some comments below. It's easy enough to do - just click on the link that says "Click here to post comments" and if you want to read what others have said you can do that too at the same place. And I'd like to take the time to say thanks to all our visitors for reading along with us. If you get the chance, please come back often to see what else is going on in our developing German Shepherd Dog neighborhood. BTW, please tell us also precisely what you think about the above narrative by leaving some intriguing feedback below. I'm so sorry for your loss! we have lost our 17month old chelios very recently. this was due to mega esaughagus, bad liver and hip dysplasia. we got him from a breeder in vicksburgh Michigan. he was the sweetest dog ever! !